To set the tone of Tooth and Tail, an early cutscene involves a man sparking a revolution out of anger after watching his son get eaten. Also, the man is a rat. Also, the rat talks. You into Redwall, Secret of Nimh, or even Felidae? If so, this dark, violent story told with cute animals is probably for you. 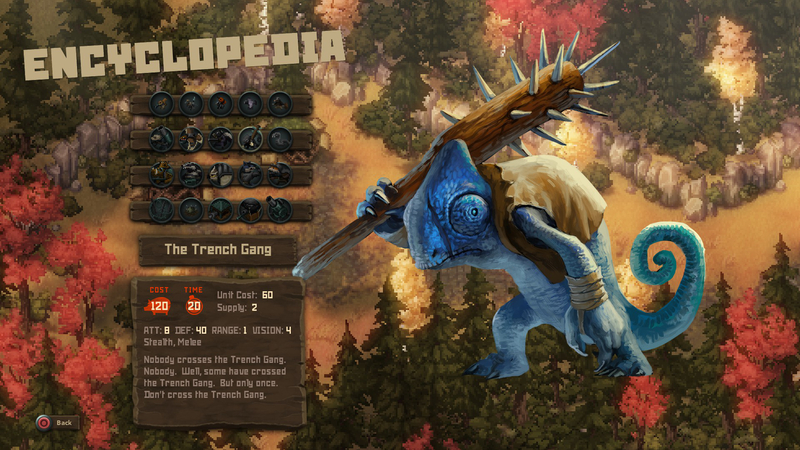 The basic conceit of Tooth and Tail is that different factions of animals are in a war for meat – as in, who’s going to be the meat for the other animals. It’s a grizzly tale (or tail, if you prefer,) of class warfare amongst different races, with scrappy farmer mice, giant sniper foxes, looming owls, and swarming lizards killing and consuming each other for their right to survive. In spite of the cute art style rendered with adorable sprite work, this is pretty grim stuff, and would infinitely more disturbing if told with humans. That said, while the conceit is interesting, the campaign itself is too short to really get a good taste of the world that Pocketwatch is trying to build. While I appreciate the effort the game makes to flesh it all out, such as giving players downtime between missions to chat with teammates, and allowing the opportunity to play as the four different factions, the fact remains that the core campaign will only take you a bit under five hours to beat. That’s a bit of a bummer, and I feel like it takes away from a long, epic feeling this sort of yarn lends itself to. Part of that, though, might be due to the nature of the gameplay itself. It’s billed as an “arcade RTS,” and almost feels close to Pikmin in terms of its execution. Players take direct control of a character and walk around the map, as the game is built around being played with a controller, as opposed to panning around and micromanaging with a cursor. If a base is in trouble, the player needs to run across the map; if they want something built, they have to walk over and make it happen. It’s kind of a cool system, speaking as an OG StarCraft veteran, and I think it does a pretty good job of hammering home genre basics without dumbing them down too much. There’s an arcade-y feeling to its delivery, but it definitely has depth for people hungry for the oft-neglected genre – as evidenced by the fun, frantic multiplayer. Also, there’s something gratifying to wrapping up an RTS match in ten minutes as opposed to, y’know, an hour or two. Also gratifying is just looking at this thing. The game makes great use of a blend of vibrant colors that are given washed out shades, conveying the sensation of a bright world besieged – a sort of faded wonderment and broken whimsy. This is accomplished by the expressive pixel art and the honestly astonishing 2D artwork, which depict creative character designs like a chaingun-wielding panda and boars decked out with flamethrowers. It’s difficult, I think, to nail something grim and cute without it treading into mid-2000’s DeviantArt territory, but this game certainly does it. 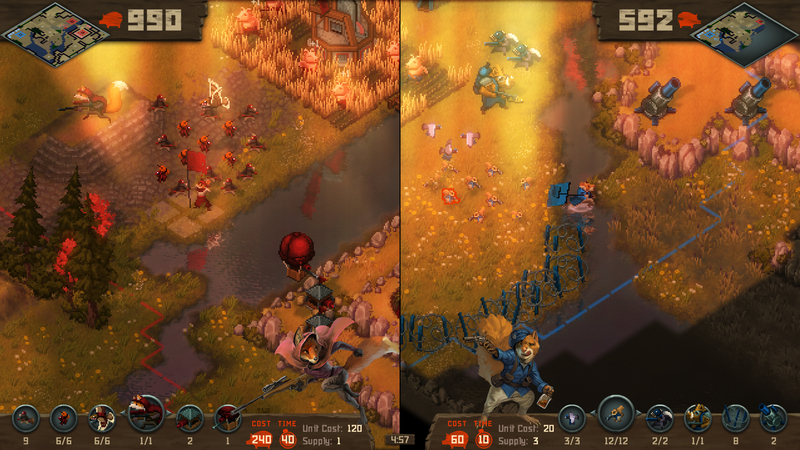 Tooth and Tail is a short, fun game that thankfully has replay value because of its multiplayer. While I certainly would have liked a longer campaign, and I admittedly have a bit of a preference towards traditional RTS gameplay, it’s impressive that Pocketwatch Games have managed to take elements of that genre I love and make it accessible to an entirely different audience. For the price, you can’t really complain. Plus, that sniper fox is just adorable.